buzz forums • View topic - Recommended MIDIcontroller? May I ask, what controllers are you using, if any? What to recommend. I have tried a novation nocturn but would like something with more knobs. Been looking at the novation zero, bcr-2000, akai midimix. Anything you would recommend? It woulds be good if it's working on win8, part from that I don't mind discontinued products. I'm on a really tight budget so it's 2nd hand shopping for me. Post subject: Re: Recommended MIDIcontroller? Come on. There must be someone more than PaulEye who's using a midicontroller. Fatar SL-990 (88-keys), Maudio Oxygen25, Korg PadKontrol and a monome 40h that I built myself. I use MidiTrix to route everything neatly, so I don't have to switch everything in preferences all the time. I just bought one of these in 37 and I'm so into it. The keys feel fantastic. It's got 16 knobs and 8 faders, but you can also switch templates with a button so you can map nearly everything up to about 920 parameters. The older mark 1 sl has two lcd screens and you can name every parameter so it shows what you're changing in buzz when you move it. This controller also has an xy pad and a 2 axis pitch/mod stick. Novation stuff is really good. Maybe I will pre order this week for an artiphon, you post about it i think, with buzz it will be great, with Scale Walker and Corona. I did. Found it on Kickstarter but never bought one. Yes I think you'll put it to good use. Ended up with a Novation remote zero mk1 that I got for €50. Even if I'm a novice it only took me minutes to understand why they made the mk2. This machine will however keep me happy a long time. Automap, which many apparently dislike seem to work very good with peerctrl. I'll look forward to seeing what you do with that! I receive the Artiphon, after 7 months, with Snowglobe Scale walker and IXSplit, it's absolutely great, I have just the instrument I want to play generative music with Buzz. Of course it's not a guitar or a piano or a violin, just a trigger, and I like triggers, with velocity and aftertouch, funny to control AT, velocity, note and pitchbend with one finger, don't hope to play a bach fugue with it, anyway with Buzz, the better daw for this controller, a little bit expansive but great for live (not in guitar mode ). Upload on your youtubechannel s'il vous plaît! I picked up a novation impulse 49 earlier this year and was disgusted with the build quality and with the automap software. I admit that part of my disgust was probably due to the fact that I only used automap and the controller with live lite, which I find positively revolting. i'm currently using a nektar panorama p4, which is handy because the creators actually bothered to make it useful out of the box with bitwig studio and reaper, which I use often. it also has a midi out which is nice for controlling a module if you don't happen to feel like playing through an interface or daw. the panorama is fantastic, as it should be considering it's price tag. the only problem I have had with it so far is that you can't upgrade the firmware unless you use the cables that come with the unit. when I asked nektar just what in the nine hells i'm supposed to do if one of their cables goes bad on me, I got crickets. I kind of gave up on using any sort of midi control with buzz in any more than a passing fashion, because I am very tired of having to remap all of my parameters every time I open a project. one of these days i'll grill everyone on what they're doing to work around this problem. the few times I've used the panorama with buzz it has been quite satisfying. there are more than enough assignable sliders, knobs and widgets, and of course the keys, mod and pitch bend need no assignment for many vsts. it's a shame that there is not really a good solution for using trigger pads with buzz at this time, so those go unused when i'm working on a bmx. 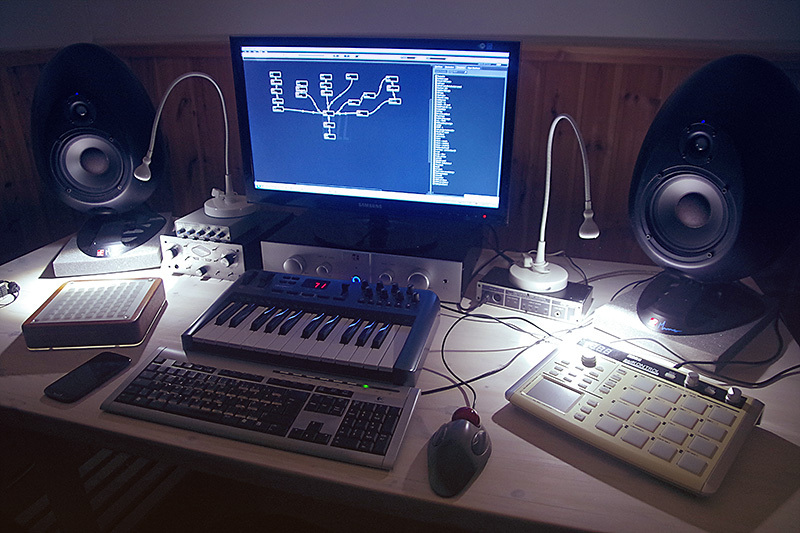 it would be great to see the jeskola clip launcher revisited and tweaked so that we could trigger patterns with midi notes and put all these pads to good use a la the various controllers that can launch patterns via pads in ableton. Another neat one is the Bitstream 3x though that i wouldn't mind. I think I wrote something about automap, Novation remote zero and Peerctrl somewhere on the forum... it's a little messy but I think it fits my needs. Both pac's Patternist and Jeskola Live are up for grabs with released sourcecode. However I don't know what to do with it. patternist i've not tried yet, good point bringing that up. jeskola live is pretty much the biggest tease of 2010 (? i think that's when that happened), an amazing leap forward from livejumphack, a proof of concept that is just dangling out there waiting for something to happen with. if i didn't have to focus so much of my computer knowledge on customer support at work and could turn it towards coding i would certainly pick up the ball there - oskari made a killer pass and it is just waiting to be grabbed up.